North East Livestock Sales sold 48 prime cattle and cows and 1,251 sheep, comprising 878 hoggs and 373 cast ewes and rams. Cattle: A better show, a bit sharper trade on the week. Lim hfrs 228p, 218p Broom Hall, 222p, 217p Swarland Old Hall, 214p Tritlington Hall, 212p, 211p Chibburn. Angus hfrs 217p, 215p Broom Hall. Char hfrs 1385, 1282 Springhill. Lim hfrs 1367 Swarland Old Hall, 1264, 1240 Chibburn. Angus strs 1302 Warton. Cows: Angus 1072 (117p) Fowberry. Hereford 1065 (125p) Braeside. B Blue 874 (130p) Braeside. Hoggs: A typical show for the time of year. A good run of 343 Cheviots sold readily, while more overweights and fewer quality export types were forward. Overall average of £88. Once again, the sale was topped at £107 (39kg) for a pen of Beltex x from Grangemoor. 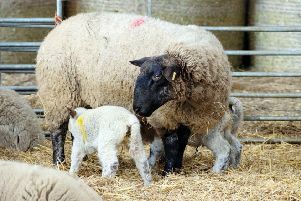 Beltex 107, 106.50, 105, 100 Grangemoor, 106, 101, 97 Old Deanham, 98 South Acton, 97.50 Howick Scar. Texels 105 East Fleetham, 103.50, 97 Delight, 101 Swarland Old Hall, 100 Grangemoor, 97, 96.50, 95 South Acton. Cheviots 93.50, 90, 89.50, 89 Stoup Hill, 91.50, 90.50, 89.50 Ferneybeds, 90.50, 87 Earsdon East, 90 Hemscott Hill, 86 Chathill. Beltex 274p, 273p, 269p, 257p, 255p, 254p Grangemoor, 259p, 240p, 231p Old Deanham. Texels 250p East Fleetham, 244p, 239p Grangemoor, 232p, 224p Howick Scar, 221p Loanend. Ewes: A mixed show of ewes, a similar trade to last week’s high rates. Overall average £75. Texels 120, 98 Old Deanham, 110 South Ryal, 105, 100 Swarland Old Hall, 100, 98 Black Heddon, 98 Bank Top, 95 East Fleetham. Beltex 104 Old Deanham. Suffolk 126 Warton, 100, 96 Nesbit, 100, 94 South Ryal, 98 High Learchild, Rashercap, 96 Bank Top. Vend 97, 91 Tughall Grange. Half Bred 86 Nesbit. Mules 85 Broom Hall, 80 Low Hall, 78 West Hall. Black Face 64, 60 Birchwood, 58 Broom Hall. Swale 50, 46 Low Bleakhope. A run of 40 rams averaged £80 overall. Texel rams 125, 124 South Ryal, 118 Loanend. Beltex rams 104 Loanend. Char rams 120, 90 Intake. Suffolk rams 114 Bank Top, 105 Broom Hall. Cheviot rams 88 Low Bleakhope. Abberfeld rams 106 Stamford.